it would be spinach. No need to think twice! I am sure there are quite a number of people in this world who hates spinach. But for me and my house? We serve the spinach. 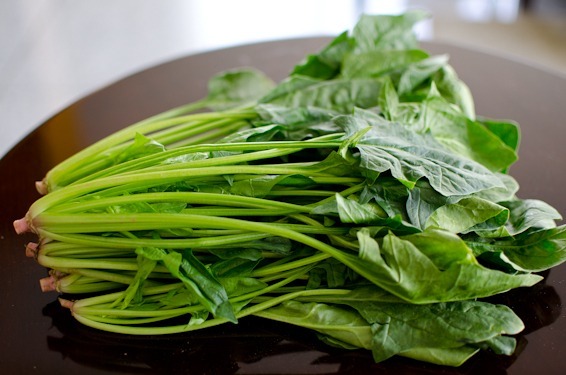 Spinach is very versatile vegetable. You can eat raw in the salad or boil in the soup. You can stir-fry or even grind up to make healthy smoothies. 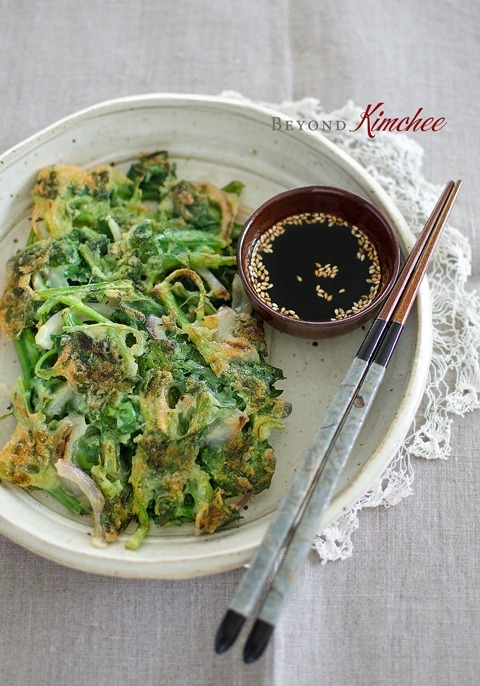 Here is a great way to enjoy the goodness of spinach; The Spinach Pancakes, Korean style! 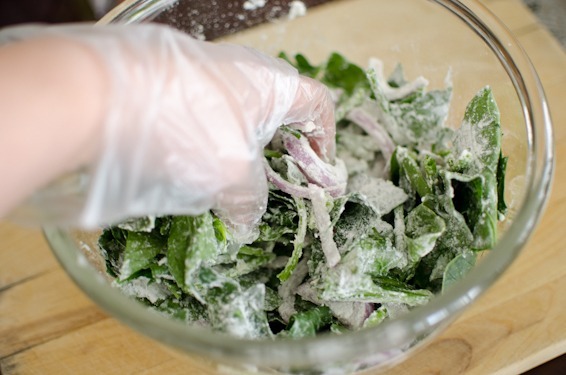 Clean your spinach and drain well. Slice them about 1.5″ lengthwise. 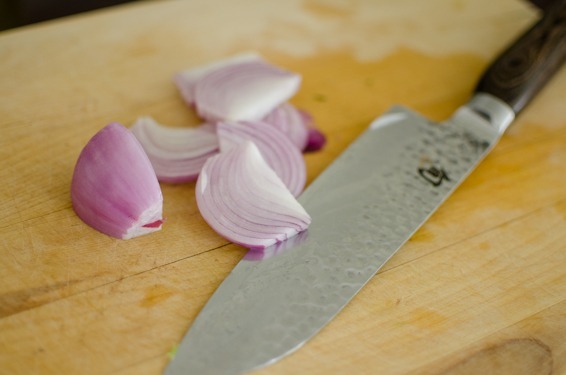 Slice small onion very thinly. Any onion will work fine. 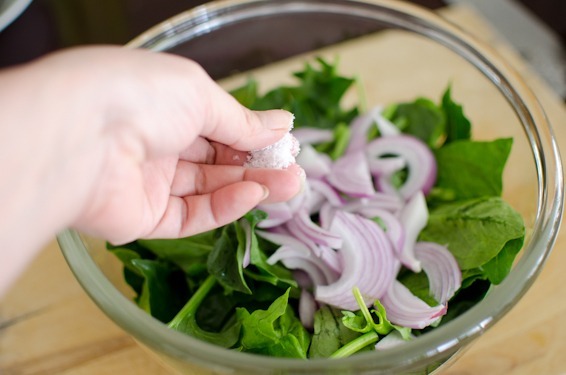 Combine both spinach and onion in a bowl, and add a couple of pinches of salt. Add flour. Start with about 1 cup of flour. You might need more depends on how you want your pancakes to be. Pour about 1/2 cup of ice cold water. 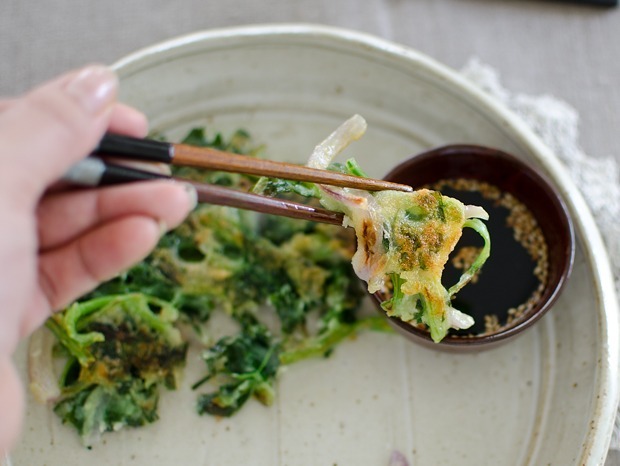 Toss all together to mix with your hand or spoon or tong. Use whatever tool that is easy for you to do the mixing job. If the mixture seems too dry, add a little more flour and water as you mix. This is the consistency I like for myself. The batter is somewhat wet and not covering the vegetable completely. If you prefer more chewy-doughy pancakes, add more flour and water to get the right consistency. There is no exact amount of flour vs water ratio for this type of pancakes. It really depends on how you like yours to be. Flip! You will see the golden crust. As you can tell there is not much of flour batter. I like it this way but if you prefer more pancake-ish, add more flour and water to the batter mixture. Drizzle a little more oil if your skillet seems dry. Cook another 3 minutes to get the golden crust on the flip side as well. Adjust the heat so you don’t burn the crust. You gotta eat your pancakes when hot to enjoy the crispness. I made the dipping sauce by mixing soy sauce ans lemon juice. And it was just right. 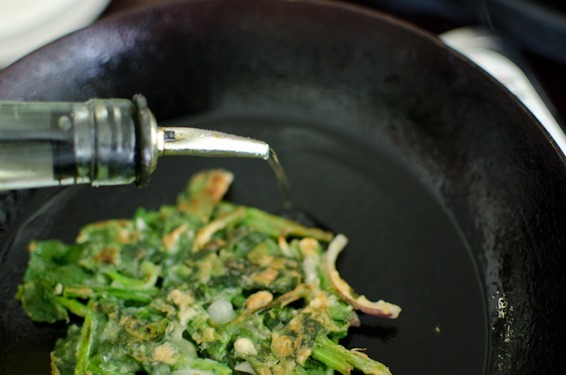 Even if you are not fond of spinach, you will be amused by the taste of these pancakes. Speaking of spinach, I just thought of couple of facts about me. 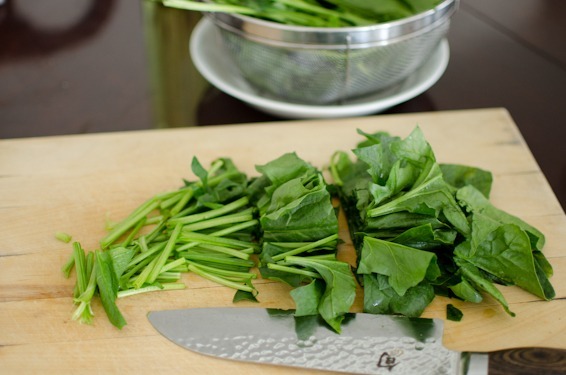 Cut spinach about 1.5" long and place in a large mixing bowl. 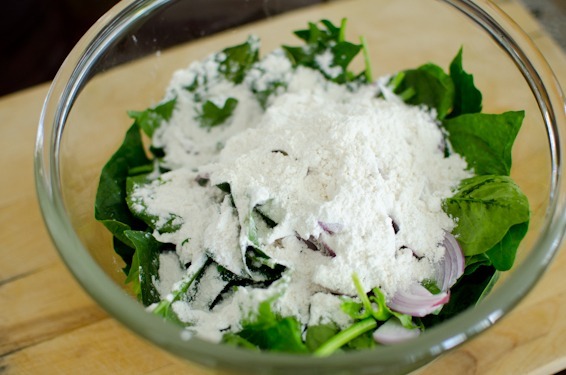 Add the onion and salt, 1 cup of flour into the bowl. 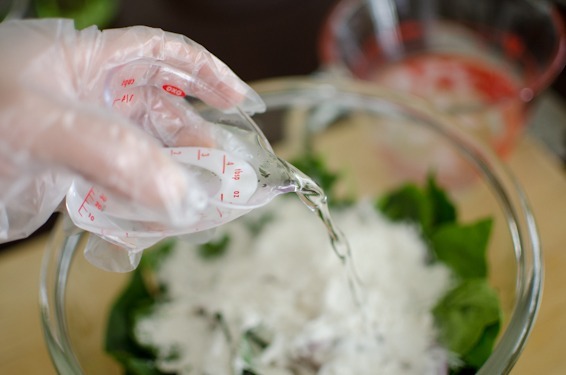 Pour 1/2 cup of water and toss everything together by using a spoon or a tong. Add more flour and water if you prefer more chewy pancakes. The batter consistency can be adjusted by your preference. Heat 1 tablespoon of oil in a skillet over medium-low heat. 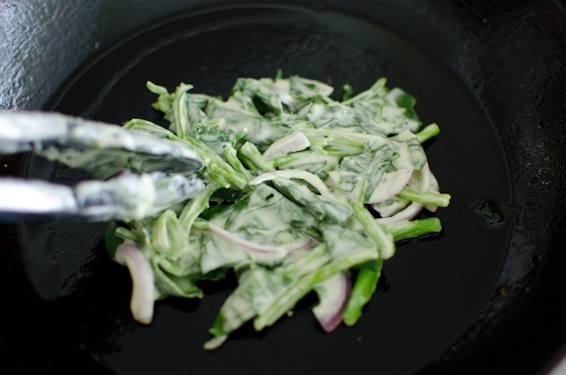 Place a spoonful of spinach batter in a hot skillet and fry for 3 minutes. Flip to the other side and continue to fry for another 3 minute. If your pan seems too dry, drizzle more oil as needed. Fry the flip side for another 3 minutes. Meanwhile, make dipping sauce by combining the soy sauce and lemon juice and toasted sesame seeds in a small mixing bowl. Looks great and will have to try this. 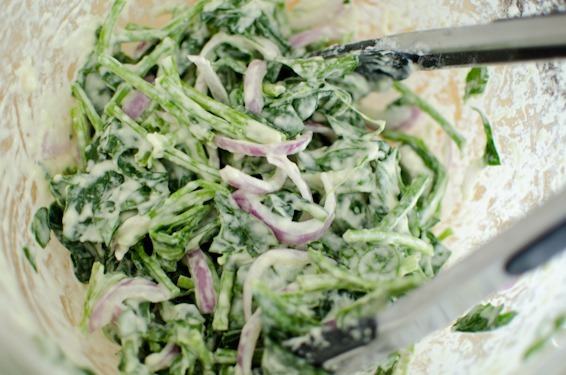 I have to agree with you on most creamed spinach, but I make one and my kids fight over it. I use 2 bags of frozen spinach thawed and well drained. Heat a nonstick frying pan with 1/2 sick of butter and put spinach in. Season with sat and pepper and about a tablespoon of minced garlic. Add about a 2/3 cup of heavy whipping cream and more butter if needed and a ton of fresh parmesan cheese. I adjust everything on how much the spinach will absorb. I have 2 children and there is usually none left by the end of the meal Maybe you would like this one. :) I have to thank you for all of your recipes. You have made my mother A very happy lady. Thanks Mindy. I think I've never had the GOOD creamed spinach so far. Your recipe sounds easy and delicious. I am going to give it a shot. really? that simple huh? I'm gonna try it. Thank you. Spinach really would be a good choice if you could have only one veggie for the rest of your life. Fortunately we don't face that quandary! Love the pancakes - I've had something like this in the past, but it's been ages. And I've never made them, which I should. Good stuff - thanks so much. This looks SO good -- love the crispness created by the thin coating of batter. I can't wait to try this! Mmm yum these look amazing :) Do you think I can replace the flour with wholemeal flour instead? Of course. That will make a very healthy version. I love spinach as well. I have green smoothies and add spinach to soups all the time. I've never tried spinach pancakes! Oh yum! Simple and quick recipes are always welcome in my house. 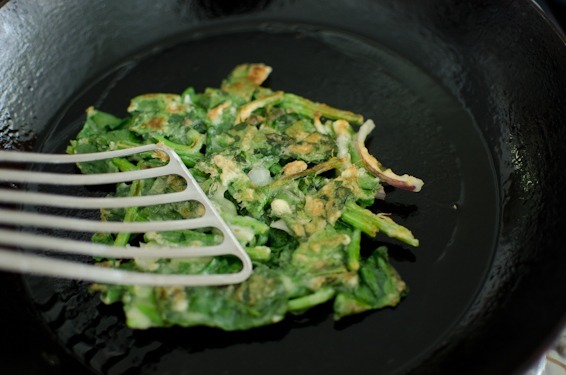 Love this spinach pancake recipe. I am crazy over spinach too! will definitely try this recipe. I am a Malaysian living in France, and ever since moving to France 10 years ago, I learned not only to eat but to know more about good food. 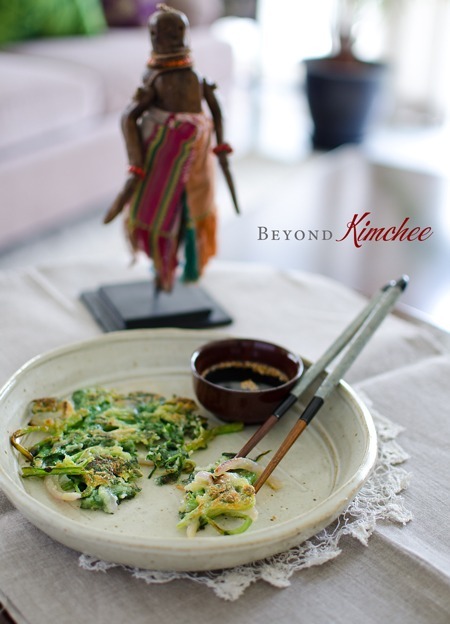 I discovered Korean food recently and I am so impressed eversinced by the healthiness of korean cuisine. 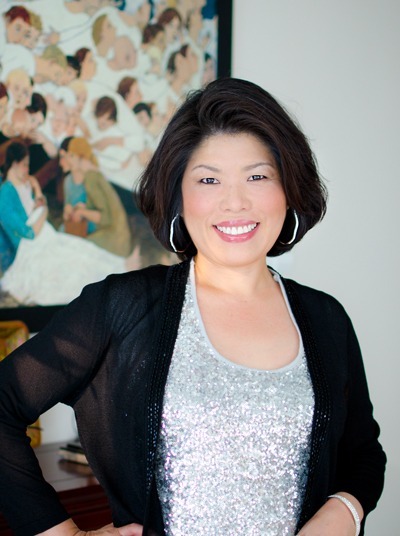 Thanks for your beautiful blog! Thank you!!!! for this "recipe". This morning as I washed my spinach for my morning smoothie and for my lunch time chicken sandwich - had a spinach and avocado salad for lunch yesterday and threw some spinach into the picadillo (ground beef w/ veggies) last night, I thought to myself that I better use it up soon... and what will I make for dinner tonight? voila!!! Holly to the rescue. This looks lovely but I think that it would be great with any number of greens. 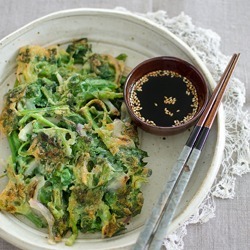 I grow all kinds of greens including Pak chois of various kinds and lots of different kinds of "cabbages" that are much lighter and crisper than European cabbage (which is also delicious fried in pancake form). Kitazawa Seed Co. is one of the oldest Japanese seed companies in the US and they sell seed for vegetables from all of Asia including Korea. http://www.kitazawaseed.com/ Thanks for the inspiration. these look delicious! can't wait for the spinach in my garden to grow and i will be making these! This looks great! 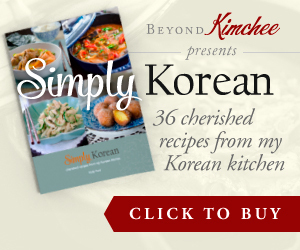 I'll just need to add some kimchi to mine to make it a bit spicy! Ahh! This looks simple :D Even *I* couldn't mess this up. Gonna try it out today. sounds really good I will try this with bean flour instead. I enjoy all your recipes. Thank You. Hi Holly I forgot to post back we tried making these at home. My kids now hate them because I have made them so much. I was making them almost every other day. I tried them with flour but they tasted kinda funny so I used a half flour and half bisquick mix and added fresh garlic to them along with your ingredients listed. I love love love them. I am trying to get that chewier version that I get at the Korean restaurants. Do know if they use rice flour or something else.? Hi Mindy, Yes, you can use rice flour for chewier texture. I would hate it, too, if I have to eat the same dish every other day. :) I am so happy to hear that you love this pancakes. I like the idea of adding bisquick. Thanks Kim There are many kinds of sauce I like. For the pancake dipping sauce, I like simple combination of soy sauce and vinegar(or lemon juice). I am glad that your brother enjoyed the pancakes. So simple yet so satisfying, I've made this twice now, but rather than the soy sauce dipping sauce, I like eating them indonesian style with some ABC chilli sauce (sambal). Yummy! Ohhh my goodness. I searched for a spinach pancake because I have so much spinach right now and found this recipe. I was surprised by HOW GOOD these taste!!! I used chickpea flour because it's all I had on hand. So good. Thank you!! !